Tampere Polytechnic - University of Applied Sciences (TAMK) - and Spanish university Rovira i Virgili of Tarragona are building a new framework to enhance the intensity of teaching, research and enterprise collaboration of higher education institutions within the southern neighbourhood policy of the EU. The organizing institutions have invited university and polytechnic rectors from a total of 35 countries from the EU, North Africa and Middle East to Tampere. The North African countries, especially, have taken an interest in familiarising themselves with the Finnish educational system and the co-operation that exists here between various enterprises and the higher education institutions. 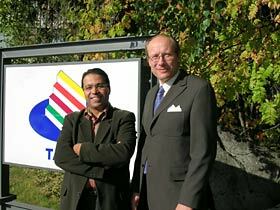 Anasse Bouhlal, Director of MEDA Institute (left) and Markku Lahtinen, rector of Tampere Polytechnic - University of Applied Sciences (TAMK). During recent years several countries in North Africa and the Middle East have been hoping to rapidly develop a deeper collaboration between their and EU higher education institutions. Thus all these countries have a high attendance at the meeting in Tampere. The MEDA Institute has also invited all the rectors of the Finnish higher education institutions, as well as the Tampere Chamber of Commerce to the meeting. The Southern Mediterranean countries have a desire to develop their societies and their international competitiveness. According to the representatives of these countries, education operational models, especially those of higher education institutions, have an important role in this development work. The countries regard the Nordic, and especially the Finnish, teaching, research and enterprise collaboration to be first class worldwide. The 2-day Euromed Universities Rectors' conference starts at TAMK on Tuesday 10th of October. This meeting is part of the Barcelona Process that started in 1995 and aims at making the Mediterranean a zone of "peace, security and well-being". All the EU countries and ten Mediterranean partners, Algeria, Egypt, Israel, Jordan, Lebanon, Morocco, Syria, Tunis, Turkey and the Palestinian Authority (PA), belong to the Barcelona Process. An important topic at the conference in Tampere is the facilitation of mobility of highly educated professionals in the EU and its neighbouring countries. Additionally, the Mediterranean partners and several of the EU countries are interested in the connections that have been established between Finnish business and technology centres and higher education institutions. There is also interest in the public funding of social research and development. The Rectors' Conference creates a basis for comparing the higher education activities, information exchange and networking and also facilitates the spreading of the best practices within the EU and with its partners. TAMK's MEDA Institute is unique in Finland. TAMK has been an initiator in organizing the conference and the Finnish Ministry of Foreign Affairs supports the conference. After TAMK the next Euromed Rectors' Conference will be held in June 2007 at the Anna Lindh foundation in Alexandria, Egypt.